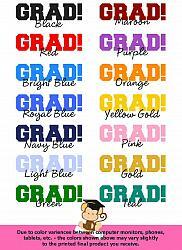 but you can choose your school color! Have a special request not on the drop down menu, just let us know in the customer comments! Our Personalized Graduation Hershey Kisses Stickers & Labels will sweeten up their special day!! Great to use for making favors, treat bags, scatter them on the tables or use at your candy bar! These 3/4" stickers also fit Reese Mini Peanut Butter Cups and Water Bottle Caps! 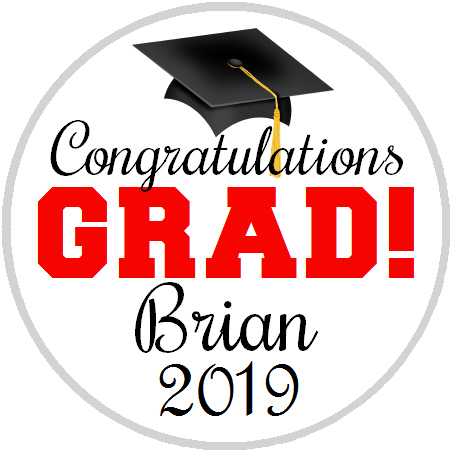 Larger circle stickers are also available - great to use on favor boxes & bags, lollipops, small Peppermint Patties, or to make cupcake toppers! FONTS COLORS: Black text prints best on these labels. If you would like a color instead, please let us know in the customer comment box. We can't print text in yellow as they are too light to read. If you choose the Hershey Kisses already completed, shipping charges go by weight and will be emailed to you after we receive your order so that we can ensure you the best rates. Please see our shipping policy for complete details.